This is fantastic! Love that you included that sack and the whole layout is wonderful. I love your CAS style! Love that you used the potato sack! So appropriate for the page! 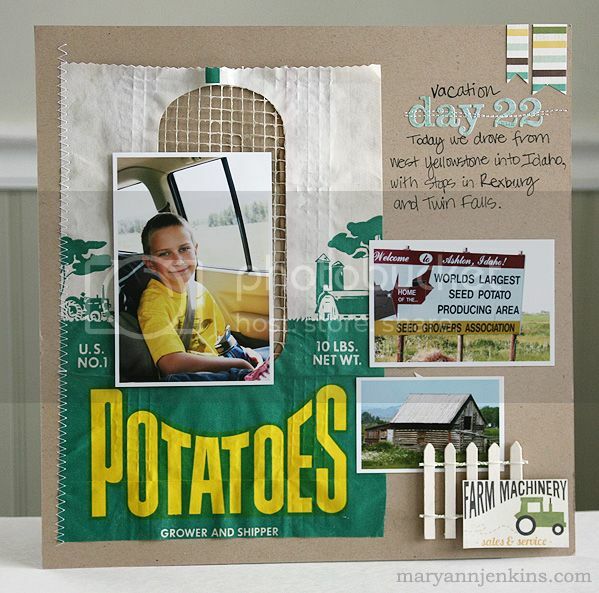 Love the potato sack for the mat behind your photo, Mary Ann!! And the little fence is so cute, too! That's great that you used the potato sack on your layout! Love it! lOVE THAT potato sack! great layout! That is TOTALLY fun! Love your layout!!! Wow! That potato sack is fabulous! Love the green in it. Love the layout! Aw, I love that potato sack. And the fence embellishment is lovely as well. Great layout! You were lucky that is. Worked out so great. It wouldn't have worked for me lol. Great layout. Way, way too cute!!! That sack is the greatest accent for your pics. very nice i lovethe letter used in the first post... bkue glitter to die for.. love it..